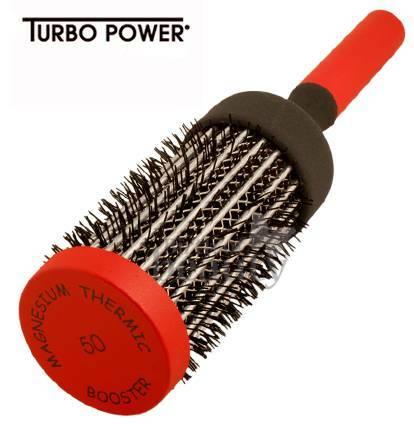 The Turbo Power Z50 brush has a 2" magnesium barrel. It is crafted with magnesium vertical rods that act as a heating element. The rods provide exceptional diffusion of heat. The wide vents channel the flow of hot air to dry and straighten hair evenly and quickly. Heat and chemical resistant. 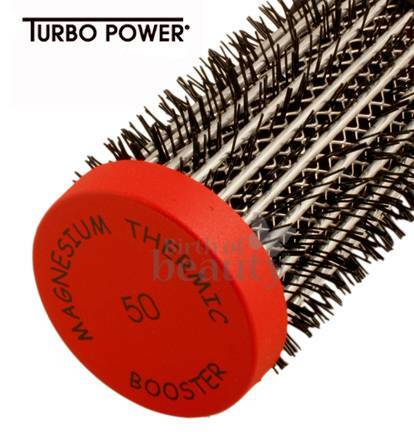 Thermic Booster Brush is crafted with magnesium vertical rods that act as a heating element. The rods provide exceptional diffusion of heat. The wide vents channel the flow of hot air to dry and straighten hair evenly and quickly. The brush guarantees a level of performance that you have never experienced before. Unique lightweight aluminum handles are coated with special textured, non-slip finish for extra control and comfort. 2" barrel.